If there was a roster of influential and innovative banjo players, Walter Hensley would be on it, but as Bill Monroe biographer Richard D. Smith writes, “Walter remains one of the underrated greats of the 5-string.” Walter — known as the Banjo Baron of Baltimore — played with Earl Taylor & the Stoney Mountain Boys and later fronted his own band, the Dukes of Bluegrass. Recorded live in the studio, this album includes two original tunes from Walt which exhibit the ingenuity, craft and pure excitement of the classic bluegrass instrumentals as well as an original song from James and his partner Tina Aridas. Along with a few traditional songs and some under-recorded gems, this album sounds like the sort of album that might have been made in those earlier days of bluegrass. What comes through to the listener is the musicians’ unmistakable and unmitigated love for the music they’re playing. This is the real thing. This album received the IBMA nomination for Recording Event of the Year and was one of only 7 nominees in that category. Up against The Chieftans and The Nitty Gritty Dirt Band, Walt declared, “Well, we might as well forget that one!” Also in 2002, James Reams was nominated by the IBMA as Emerging Artist of the Year. 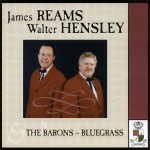 Thirteen cuts of great traditional bluegrass music by great traditional bluegrass musicians.